The Q80WD is an addition to the uprox+ family of factor one sensors that require no correction factor to detect any metal type. The Q80WD features an improved design with a durable, stainless steel M12 connector and chemical resistant PPS thermoplastic housing that delivers resistance to chemicals and caustic cleaning agents, as well as shock and impact. Additionally, the housing materials are food-safe and meet FDA Regulation 21CFR 177, 1500(9) for the U.S. and FDA/EGVO 1935/2004 for the E.U. The Q80WD features 2 side mounted LED's for optimal viewing. "The introduction of the Q80WD allows us to offer an even wider range of washdown sensor solutions for our customers", said John Murphy, Product Manager for TURCK. "With an extended range of 75mm, the uprox+ washdown family can provide a perfect solution in a variety of applications including food and beverage, mobile equipment, and many outdoor installations. 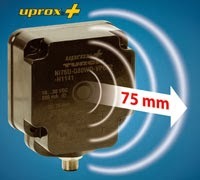 The existing uprox+ washdown family is comprised of 8, 12, 18, and 30mm diameter barrels, 42mm Qpaks with sensing ranges between 1.5 and 50mm. The uprox+ technology is able to sense all types of metals at the same distance, not only eliminating the need to change the position of the sensors for different metal applications, but also reducing the number of sensor types needed for plant operations. In addition to an extended sensing distance, the Q80WD delivers reliable operation in temperatures ranging from -25 degrees to +70 degrees Celsius and is IP68 approved or IP69k approved with optional back plate.